It’s the final day of July and we’ve been going through the top units across the NFL over the past few weeks. Included in those were our oft-talked about offensive line rankings, our defensive unit rankings on pass-rush, run-defense and in the secondary. But now, we turn our attention to the offensive side of the ball again. Utilizing data from our newly-released Premium Stats 2.0, we unveil our top 32 pass-catching units as we enter the 2018 NFL season. The Vikings 1-2 punch is simply unrivaled across the NFL at the moment. Adam Thielen and Stefon Diggs are both top notch route runners with exceptional ball skills. 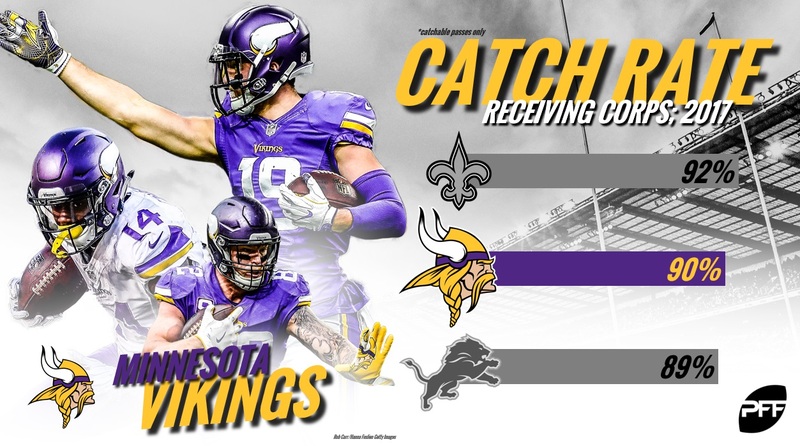 Both finished among the top 10 in contested catch rate a season ago with Diggs actually leading the league. Now throw Kendall Wright in the slot – the Bears most productive receiver a season ago – and you have a complete receiving corp. It should be no surprise that the Vikings have signed Diggs to a contract extension, locking him up until 2023. We were splitting hairs between the top two here with Sammy Watkins down 2017 season being the lone differentiator. The Chiefs have the league’s most productive deep receiver from a season ago in Tyreek Hill and the most productive tight end from the slot in Travis Kelce. Kareem Hunt’s receiving ability shouldn’t go unnoticed as well as he broke 16 tackles on 61 receptions last year. With Cameron Brate getting a big money extension and a first-round pick invested in O.J. Howard, the Bucs are one of the few teams that boast two receiving threats at tight end. Add that pair to Mike Evans and DeSean Jackson, and Jameis Winston will have a full stable of weapons once again upon his return. Howard is the wild card of the group as he only ran 233 routes as a rookie, but his 1.85 yards per route was fifth best among all tight ends. 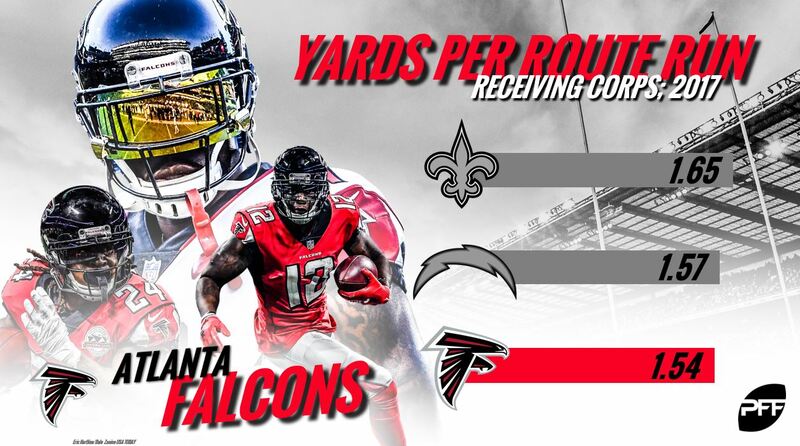 Julio Jones could make any receiving corps a top-10 unit, but now the addition of Calvin Ridley has the ability to push this unit even higher. Ridley was tabbed as the best route runner in the entire draft by us here at PFF and was very productive at Alabama despite what his raw totals might say. He didn’t crack 1,000 yards last season, but Alabama rarely passed, and Ridley’s 2.78 yards per route run was still eighth best of any Power-5 receiver in the draft class. Everything said above about Jones can be said for Antonio Brown. The Steelers wideout has averaged a 92.5 grade over the past five seasons. Juju Smith-Schuster dominated as a rookie, especially on go routes, averaging a perfect 158.3 passer rating when targeted on the route. The effectiveness on this group though will depend on how NFL-ready rookie James Washington is. The Oklahoma State product led the NCAA last season with 815 deep receiving yards – 121 yards clear of second place. What a difference a year makes. There were parts of the 2017 season where the Browns looked as if they had arguably the worst receiving corps in the NFL. Now with the return of Josh Gordon, trading for Jarvis Landry, getting Corey Coleman healthy and David Njoku in Year 2, the sky is the limit for Cleveland. The Browns also feature one of the league’s best receiving backs in Duke Johnson, who was third in yards per route among running backs a season ago (2.08). The Giants could very well exceed this ranking by the end of the season, but it will take second-year tight end Evan Engram taking a big step forward. His raw stats of 64 catches and 722 yards look solid for a rookie, but they don’t tell the whole story. Those catches came on 108 targets, the second most of any tight end. Engram also led all tight ends with 11 drops and had only a middling 1.46 yards per route run last season. 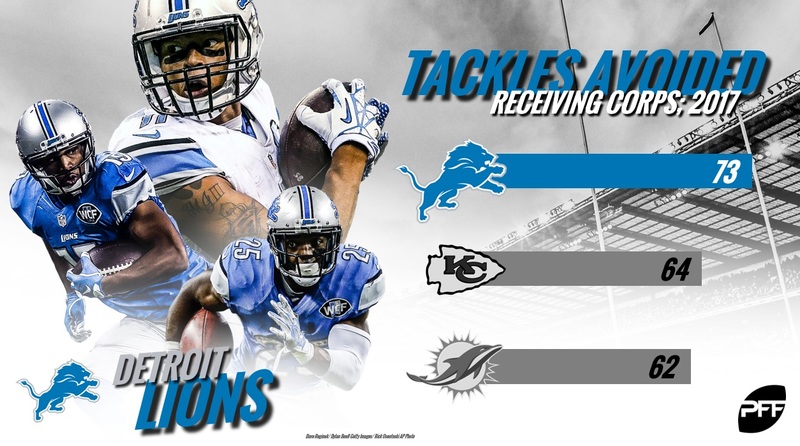 Golden Tate and Marvin Jones have been consistently productive in their time with the Lions. Jones has been the big-play weapon with 599 deep receiving yards last year – the third most in the league. Tate on the other hand has been the league’s foremost underneath threat as he led all receivers with 22 broken tackles a season ago. Los Angeles would have been much higher prior to the injury of Hunter Henry, but their top-10 ranking still reflects the talent they’ve accrued at receiver. When healthy, Keenan Allen is one of the most unguardable receivers one-on-one. His 89.1 overall grade last year was the fifth best at the position. This unit will need Mike Williams to live up to his draft status in Year 2 though. Williams played all of 234 snaps last year due to injury. 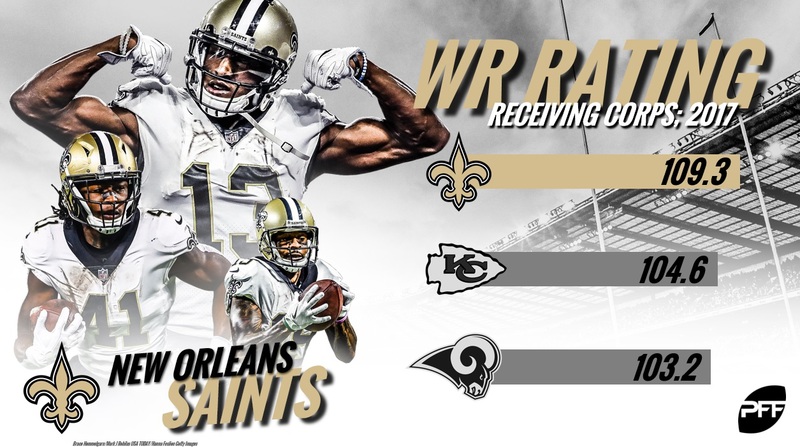 The Saints sneak into the top 10 on the backs of two players who are entering the argument for best receivers at their respective positions. Michael Thomas earned the second-highest grade of any receiver in the league (93.0) in only his second season in 2017. Alvin Kamara one-upped him and earned the highest receiving grade of any back (92.8) as only a rookie last year. The potential with this group is off the charts. From 2015-2016, Tyler Eifert hauled in 18 touchdowns on only 1,268 snaps. Injuries have robbed him of contributing since, but the talent is still there. Then you have last year’s top-10 pick, John Ross, who also couldn’t stay on the field and played all of 17 snaps a season ago. If either or both live up to their potential and stay healthy, they’ll be a top 10 unit. With all the struggles that we’ve seen from rookie wide receivers of late, Cooper Kupp’s rookie season should be incredibly encouraging for Rams fans. Kupp’s 2.04 yards per route from the slot was top five among all receivers, and he likely would have led the league if it weren’t for an uncharacteristic five drops on 51 catchable targets. His last year at Eastern Washington, Kupp dropped all of six passes on 125 catchable targets. After the Browns, the Bears made the biggest leap in the receiving corps rankings this season. Allen Robinson, Anthony Miller, Taylor Gabriel and Trey Burton were all wearing different uniforms at this time last season and figure to now be the lifeblood of the Bears offense. If there is any reason concern, it’s that those four, along with former top-10 pick Kevin White, combined to play a grand total of 964 snaps in the NFL last season. While the Patriots lost Brandin Cooks and Danny Amendola this offseason, they signed Jordan Matthews and got back Julian Edelman. Even if it’s likely to be a net downgrade, they still have the league’s best tight end roaming the middle of the field. Only two tight ends averaged over 2.00 yards per route last season. Rob Gronkowski hasn’t averaged under 2.00 since his rookie year. Once one of the league’s top receiving duos, Emmanuel Sanders and Demaryius Thomas have seen their effectiveness dip of late. Thomas in particular has been nowhere near as dynamic after the catch. He averaged just under 15 broken tackles per year from 2012-2015. That number has dipped to only 7.5 over the last two seasons. If this receiving corps is going to be ranked higher than this by the season’s end, it’s going to take Will Fuller staying healthy and consistent. He had seven touchdowns and averaged 1.96 yards per route with Deshaun Watson at quarterback. With all other quarterbacks in Houston last year, he did not score a touchdown and averaged 0.80 yards per route. The Eagles lost Torrey Smith this offseason, but he was more decoy than productive receiver in Philly. His 0.97 yards per route were 84th among 93 qualifying receivers last year. Either Mike Wallace or Mack Hollins should easily be able to pick up where Smith left off. The most interesting takeaway from this receiving corps last year was Nelson Agholor’s drastic turnaround when being moved to the slot. Agholor averaged a putrid 0.65 yards per route the first two seasons of his career before jumping to a respectable 1.56 last year, while spending the majority of his time lined up inside. The signing of Jimmy Graham this offseason could pay big dividends for the Packers, but at the same time, there is a reason the Seahawks let him walk. Graham is coming off a season in which he only caught one deep ball and posted a career low 9.1 yards per reception. His 10 touchdowns on 57 catches though still prove he’s a threat where it matters most. Doug Baldwin is still arguably the most underrated receiver in the NFL today. The last time he didn’t have a passer rating when targeted over 100.0 was back in 2012. Over the last three seasons, he’s averaged only three drops per year compared to almost 11 touchdowns and 14 broken tackles. For the Redskins receiving corps, it is all about health. Their top two options, Josh Doctson and Jordan Reed, have played all of 1,582 snaps over the past two years (two full seasons from each would be around 3,500 snaps). No offense can afford that type of unavailability. One need look no further than the playoff game against the Saints last year to see that Greg Olsen is still one of the league’s best tight ends when healthy. He posted three-straight 1,000 yard seasons before being held to only 358 snaps last season. This group will need immediate contributions from rookie D.J. Moore though, to be effective, which is worrisome with what we’ve seen from recent rookie wide outs. Moore will at least be a threat with the ball in his hands as he broke 20 tackles on only 80 catches last season at Maryland. T.Y. Hilton is still on the roster, but pretty much everyone else from the productive Colts teams of Andrew Luck’s prime is gone. One under-the-radar signing that could pay off is tight end Eric Ebron. He quietly averaged 1.86 yards per route from Week 8 on last year and goes to a Frank Reich-led offense that featured the tight end position heavily in Philadelphia. Despite the low ranking, the Ravens are one of the most improved receiving corps in the league. With Mike Wallace as the top option a season ago, it’s hard to get much worse. 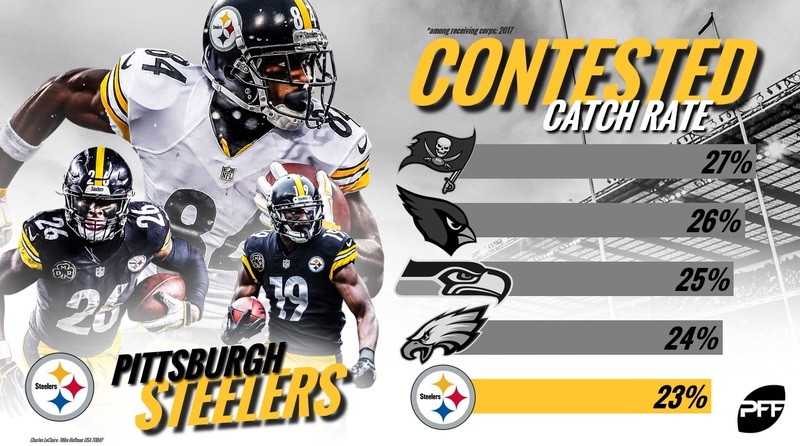 Their top four in targets could all be new faces this season as they signed Willie Snead, Michael Crabtree, John Brown and drafted tight end Hayden Hurst this offseason. While neither of those players earned a grade higher than 71.4 a season ago, it’s still a fairly massive upgrade all-around. While you’ve heard of running back by committee, the 49ers are going to be receiver by committee in 2018. Five different players saw at least 60 targets for the 49ers last year and that figures to be no different this year. Marquise Goodwin was the de facto No. 1, seeing 102 targets, but with Trent Taylor and George Kittle heading into Year 2 and now rookie second-rounder Dante Pettis on the roster, anyone could take the reigns. The Dolphins receiving corps is filled with players who have tantalized at times over their career, but disappointed with their consistency. Both Kenny Stills and now Devante Parker cracked the 80.0-grade threshold in their second seasons, yet haven’t been able to recreate it since. The quarterback situation last year in Miami didn’t help, but they’ll need one of those two to take a step forward in 2018. Amari Cooper’s 2017 season was one of the most head-scratching in recent memory. Drops have always been an issue for him but dropping 10 balls on 48 catchable targets is beyond terrible. If you take away Cooper’s Week 7 bonanza against the Chiefs where he went for 210 yards (and also dropped two passes), the former top-five pick averaged an abysmal 1.14 yards per route last season. That inconsistency is drive-killing and disappointing for a man with his talent. If this were prior to the 2017 season you’d feel a lot better about the prospects of Quincy Enunwa and Terrelle Pryor on the roster. In 2016, Enunwa averaged 1.59 yards per route while Pryor averaged 1.70 – both with fairly ugly quarterback situations. Enunwa spent this past year on injured reserve with a neck injury while Pryor was wholly ineffective in Washington before heading to injured reserve himself. The fact that the Cowboys brought in Tavon Austin this offseason should tell you about how bleak their receiving corps looks at this point. There’s some mild hope that either Michael Gallup or Cedrick Wilson can contribute right away as rookies, but it’s rare for third- and sixth-round picks, respectively, to be immediate impact players. Terrance Williams has been a mainstay in the Cowboys lineup the past five seasons despite averaging under 1.50 yards per route over that span. The Jaguars roster is full of No. 2 and 3 type receivers who have yet to establish themselves as even productive doing that. Free-agent signing Donte Moncrief’s 78.0 overall grade is the highest any of them have earned in a single season and Marqise Lee’s middling 1.67 yards per route last year was the highest of the group as well. Only a few seasons removed from a receiving corps that looked like a top-five unit with Larry Fitzgerald, Michael Floyd and John Brown, the Cardinals have seen that group crumble of late. Floyd and Brown have departed while Fitzgerald chugs on into his mid-30s. It’s gotten so bad that they actually brought in Greg Little, a former second-round pick who hasn’t taken an offensive snap in the NFL since 2014 and has 32 drops on 193 catchable passes in his career. Kelvin Benjamin was not the offense-changer they may have hoped for when trading for him last year. He averaged all of 1.28 yards per route as the team’s No. 1 receiver. That’s an ugly number, but not when compared to rookie Zay Jones. Jones was second to last in the entire NFL, averaging only 0.69 yards per route last year.